This is Mr. Luk, the same guy in my previous post who painstakingly wrote the english translation of the more famous chinese dishes that he assumed we will be ordering. 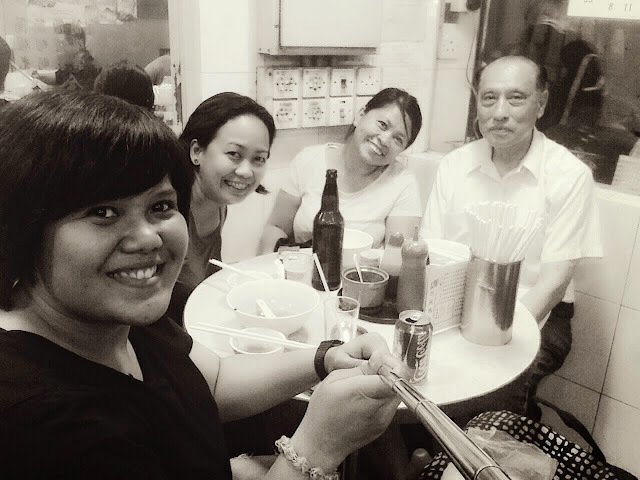 He treated us to a noodle dinner and a conversation that mostly involved sign language and crooked english, we came upon asking him if he has already gone to the Philippines. He said not yet and shook his head. Ate Jet, the woman seated beside him quipped, "ayaw niyan baka ma-Mendoza daw sya." I was too shy to ask what she meant by ma-Mendoza meant until Mr. Luk started describing the "former president who asked sorry". That's when I recalled what Erap was saying sorry for. It was a heavy topic to discuss over beef brisket, coke and beer. I would've wanted to say sorry too and tell him that not all Filipinos will "Mendoza" him, them but I didn't know how to. anti-social hormonal evil drama queen with an insatiable wanderlust, loves hello kitty, fantail goldfish, menudo for ulam, pies and ice cream and anything from the 90s and below. Writes on her left hand and sees the world in lomo. I write about life-- travels mostly, food, people, conversations and love. And just like in any Karenderya, you will find a lot of options which will either feed you or make you feel sick. Dine at your own risk.